The festive city of San Juan is the perfect place to experience true Puerto Rican culture and a United Airlines® flight can take you there. 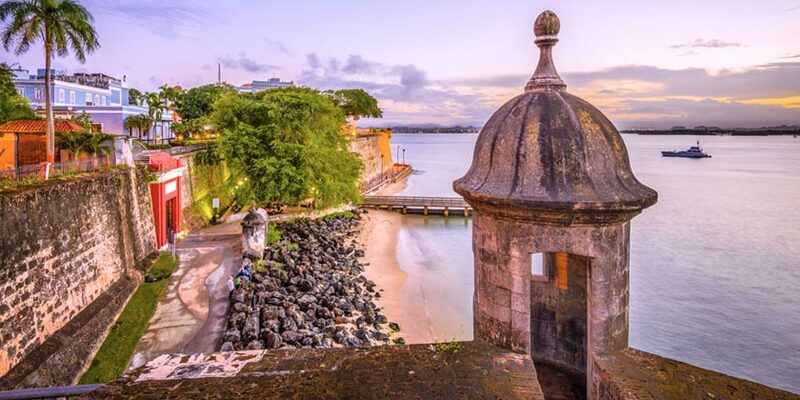 Learn about the city’s past by exploring the cobblestone streets and vibrant colonial-era buildings of Old San Juan, an original Spanish settlement. Beyond the many historical sites, like the San Jose church, is a bustling cosmopolitan city that features high-rise hotels, an abundance of shopping venues, and a wide variety of restaurants. The area beyond the city is also worth exploring. Hike through jungles, surf the west shore near Rincon, or experience the natural wonder of Bioluminescent Bay where the water actually glows in the dark. United Vacations offers vacation packages to many great destinations all over the world and Puerto Rico is no exception. Book your next vacation to San Juan with United Vacations today. Enjoy a guided tour of the Bacardi Rum plant where you will learn the procedures of rum manufacturing of the world-famous Bacardi Company. A guide will lead you on an exploration of the El Portal Visitor's Center, La Coca Falls and the Yokahu Observation Tower. Resort info: Family-friendly amenities, dynamic dining options and a relaxing atmosphere, enjoy superior stays at this inviting island getaway. Resort info: Nestled on Puerto Rico’s northeastern coast in Coco Beach, Rio Grande, this romantic, all-suite getaway boasts beautifully-appointed, junior suites. Resort info: El Conquistador offers luxurious accommodations in five distinct resort villages. Resort info: Fronting two miles of white-sand beach on Isla Verde, this stunning getaway offers the ideal tropical setting for unforgettable vacations. Resort info: Conveniently located in the fashionable Isla Verde area, this upscale resort is the heart and soul of Puerto Rico. Resort info: Beachfront in Isla Verde amidst a charmed world of white-sand beaches and cool turquoise ocean, this resort blends comfort and convenience.